Israeli settlements built on stolen Palestinian land have been ruled illegal by the International Court of Justice. Nearly half of the settlements in the Jordan Valley grow dates, its their most profitable crop, and contributes significantly to their economic viability. Most of the Israeli date crop – up to 80%, is exported, mainly to Europe where it has around 10% market share. In 2005, dates were Israel’s leading fruit export. If you oppose the settlements target their dates. Picking of the dates is hard work, Israeli settlers bring in low payed Palestinian labourers to do this back breaking work. During the pruning season, workers are dropped on the date palm trees by a hoisting crane at 5 in the morning, left perched on palms that soar to heights of 12 metres – a 4 storey building, left there swaying in the wind for up to 8 hours without even a toilet break, with no means to come down until the crane returns at the end of the day, the workers cling to the tree with one arm and work with the other to meet their quota. If they complain or fall behind they will lose their jobs. The Israelis prefer to employ children – even issuing them official work permits, as they can climb trees faster, work for less and it’s easier to cheat and humiliate them. Out of desperate poverty Palestinian families are forced to take their children out of school and hand them over to the settlers to work for a pittance. The two major Israeli companies involved are Agrexco and Hadiklaim. Agrexco, half owned by the Israeli state, handles 60-70% of all goods produced in the settlements. Its dates have brand names Carmel, Jordan Plains and Jordan Valley. Carmel boasts that they manage an early crop of dates in time to meet the Ramadan demand from Europe’s Muslims! Hadiklaim, the Israeli Date Growers Cooperative, which includes illegal settler plantations in the Jordan Valley, sells 65% of all Israeli dates. Its dates have brand names King Solomon and Jordan River. They also supply Israeli dates to supermarkets who market them under their own brand. These include Marks & Spencer, Sainsbury’s, Tesco, Asda and Waitrose. 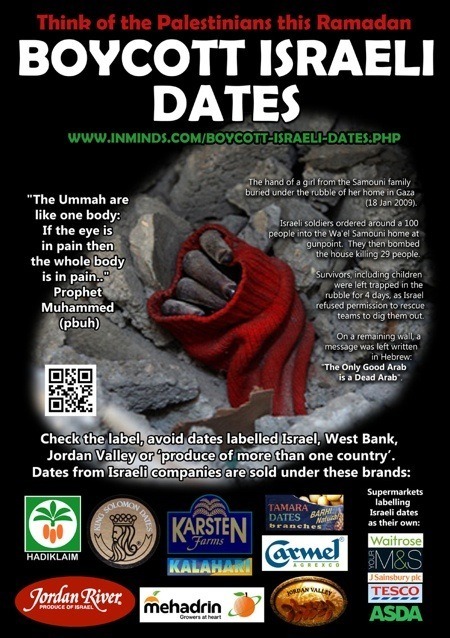 Sometimes they are labelled “produced in the West Bank” – remember these are not Palestinian dates. Peace activists who visited the Palestinian village of Fasayl in the Jordan Valley discovered that villagers are slowly being forced off their land by the Israeli army for future settlement expansion. The only livelihood left open to them is to work for Carmel Agrexco. The activists even spoke to two Palestinian children under the age of 12 who were working for Carmel. The Palestinian workers whose land had been stolen and were forced to work for Carmel in order to feed their families – they had a message for the peace activists, a plea for anyone who would listen – they urged them to take action against Carmel Agrexco and such companies that support Israeli apartheid. What excuse is left for us not to boycott Israel?